Zurich, Switzerland-based Climeworks asks, What if we could remove carbon dioxide directly from the air? Well, with a little help from technology, that is exactly what the company is doing. The world’s first commercial carbon capture facility opened in Zurich, Switzerland on June 3, perched beside a waste incineration facility and a large greenhouse. Climeworks is a spin-off company from the Swiss science, technology, engineering, and mathematics university ETH Zurich. The startup company built the facility and Agricultural firm Gebrüder Meier Primanatura, which owns the huge greenhouse next door, will use the heat and renewable electricity provided by the carbon capture facility to run the greenhouse. The carbon capture plant consists of three stacked shipping containers that hold six CO2 collectors each. Each CO2 collector consists of a spongy filter. Fans draw ambient air into and through the collectors until they are fully saturated, while clean, CO2-free air is released back into the atmosphere, a process that takes about three hours. Basically, carbon capture and storage (CCS) involves three phases. Capture – Carbon dioxide is removed by one of three processes, post-combustion, pre-combustion or oxyfuel combustion. These methods can remove up to 90 percent of the CO2.The next phase is Transportation – Once the CO2 is captured as a gas, it is compressed and transported to suitable sites for storage. Quite often, the CO2 is piped. In Climeworks facility, it is collected in containers on-site to be used in a variety of industries. Carbon storage diagram showingmethods of CO2 injection. Storage of CO2 is the third stage of the CCS process – This involves exactly what the word implies, storage. Right now, the primary way of doing this is to inject the COs into a geological formation that would keep it safely underground. Depleted oil and gas fields or deep saline formations have been suggested.Again, Climeworks is re-purposing the captured pure CO2. They are selling containers of carbon dioxide gas to a number of key markets, including food and beverage industries, commercial agriculture, the energy sector and the automotive industry. This atmospheric CO2 can be found in carbonated drinks, in agriculture or for producing carbon-neutral hydrocarbon fuels and materials. 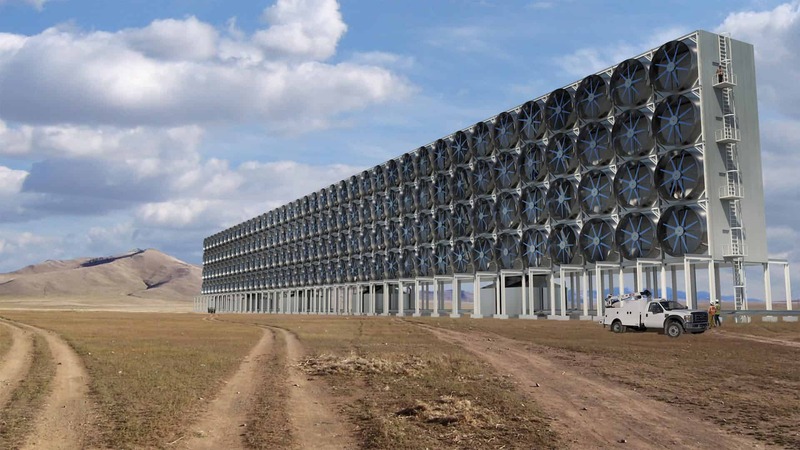 Futurism is reporting that Climeworks says that if we are to keep the planet’s temperature from increasing more than 2 degrees Celsius (3.6 degrees Fahrenheit), we will need hundreds of thousands of these carbon capture facilities. But at the same time, this does not mean we should stop trying to lower greenhouse gas emissions. All over the planet, technology is being used to find innovative ways to capture carbon and use it for other purposes. One example – researchers at the University of California, Los Angeles (UCLA), have found a way to turn captured carbon into concrete for use in the building trade.